Kuwait Times mourns the passing of one of its oldest and most dedicated professionals today after his sad and untimely death yesterday. Xavier Moraes was an exceptional journalist, a hardworking and hard driving editor and dedicated to the newspaper. Xavier joined the paper when I was around six years old. I remember going to the office with my dad and he would call me over to his desk, hand me pens and paper and invite me to color. He was a fixture in Kuwait Times, steady and reliable as a clock and one of the people that contributed to its success for more than the 30+ years. In his role as Sports Editor, Xavier always knew the important games – and the latest footballer gossip – and how to get the best of sports news to our readers. He was a vital part of the editorial team and a leader in his chosen profession. Personally, I always knew the man to be a polished professional who got the job done even sometimes in the most challenging of circumstances. 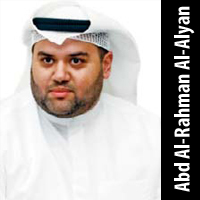 I cannot thank him enough for his long service and contribution to the Kuwait Times. Neither he nor his stamp on the newspaper will ever be forgotten. My deepest condolences to his family and May God Almighty Rest His Eternal Soul.